Waveforms The maximum arbitrary waveform size is 1 M points. Up to 500 user-defined waveforms may be stored on the removable memory card. Arbitrary waveforms can be defined by front panel editing controls, by downloading of waveform data via RS-232,USB or GPIB, or by writing directly to the removable memory card using the USB card reader/writer connected to a PC. Waveform memory 1 M points. Minimum waveform size is 8 points. Sequence Up to 1024 waveforms may be linked. Each waveform can have a loop count of up to 32,768. A sequence of waveforms can be looped up to 1,048,575 times or run continuously. Trains of up to 10 pulses may be specified, each having independently defined width, delay and level. The baseline voltage is separately defined and the sequence repetition rate is set by the pulse train period. Max. carrier frequency The smaller of 2.5 MHz or the maximum for the selected waveform. 100 Msamples/s for ARB or Sequence. Trigger source Internal from keyboard or trigger generator. External from TRIG IN or remote interface. Max. carrier frequency The smaller of 2.5 MHz or the maximum for the selected waveform. 80 Msamples/s for ARB or Sequence. Gate signal source Internal from keyboard or trigger generator. External from TRIG IN or remote interface. Sweep Capability provided for both standard and arbitrary waveforms. Arbitrary waveforms are expanded or condensed to exactly 4096 points and DDS techniques are used to perform the sweep. Carrier waveforms All standard and arbitrary except pulse, pulse train and sequence. Sweep mode: Linear or logarithmic, continuous or triggered. Sweep range 1 mHz to 40 MHz in one range. Phase continuous. Independent setting of start/stop frequency. Sweep trig. Source The sweep may be free run or triggered from the following sources: Manually from keyboard. Externally from TRIG IN input or remote interface. Tone Switching Capability provided for both standard and arbitrary waveforms. Arbitrary waveforms are expanded or condensed to exactly 4096 points and DDS techniques used to allow instantaneous frequency switching. Trigger rep. rate 0.005 Hz to 100 kHz internal, dc to 1 MHz external. Usable repetition rate and waveform frequency depend on the tone switching mode. Source Internal from keyboard or trigger generator. External from TRIG IN or remote interface. Gated The tone is output while the trigger signal is true and stopped, at the end of the current waveform cycle, while the trigger signal is false. The next tone is output when the trigger signal is true again. Triggered The tone is output when the trigger signal goes true and the next tone is output, at the end of the current waveform cycle, when the trigger signal goes true again. FSK The tone is output when the trigger signal goes true and the next tone is output, immediately, when the trigger signal goes true again. Signal range Approximately 2 Vpk-pk input for 20 Vpk-pk output. Source Internal source 0.005 Hz to 100 kHz squarewave adjustable in 10 us steps. 3 digit resolution. Available for external use from the SYNC OUT socket. Amplitude 5 mV to 20 V pk-pk open circuit (2.5 mV to 10 V pk-pk into 50 Ω. Amplitude can be specified open circuit (Hi Z) or into an assumed load of 50 Ωor 60 Ω, in Vpk-pk, Vrms or dBm. Ampl. accuracy Better than 2 % ± 1 mV at 1 kHz into 50 Ω.
DC offset range ± 10 V. DC offset plus signal peak limited to ± 10 V from 50 Ω.
Waveform sync (All waveforms) A square wave with 50 % duty cycle at the main waveform frequency, or a pulse coincident with the first few points of an arbitrary waveform. Trigger Selects the current trigger signal. Useful for synchronising burst or gated signals. 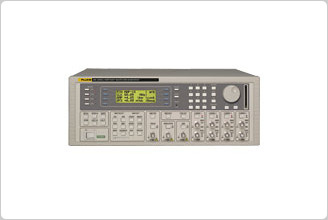 Sweep sync Outputs a pulse at the start of sweep to synchronise an oscilloscope or recorder. Can additionally output a sweep marker. Phase lock out Used to phase lock two generators. Produces a positive edge at the 0o phase point. Output signal level Logic level of < 0.8 V to > 3 V for all outputs except Sweep Sync. Sweep Sync is a 3-level waveform. Hold Holds an arbitrary waveform at its current position. A TTL low level or switch closure causes the waveform to stop at the current position and wait until a TTL high level or switch opening which allows the waveform to continue. The front panel MAN/HOLD key or remote command may also be used to control the Hold function. Set to input Input for an external 10 MHz reference clock. TTL/CMOS threshold level. Set to output Buffered version of the internal 10 MHz clock. Output levels nominally 1 V and 4 V from 50 Ω.
Inter-Channel Modulation The waveform from any channel may be used to Amplitude Modulate (AM) or Suppressed Carrier Modulate (SCM) the next channel. Alternatively any number of channels may be Modulated (AM or SCM) with the signal at the MODULATION input socket. Inter-Channel Analogue Summing Waveform Summing sums the waveform from any channel into the next channel. Alternatively any number of channels may be summed with the signal at the SUM input socket. Sum source Internal from the previous channel. External from SUM IN socket. Inter-Channel Phase Locking Two or more channels may be phase locked together. Each locked channel may be assigned a phase angle relative to the other locked channels. Arbitrary waveforms and waveform sequences may be phase locked but certain constraints apply to waveform lengths and clock frequency ratios. Phase error < ± 10 ns all waveforms. Inter-Channel Triggering Any channel can be triggered by the previous or next channel. The previous/next connections can be used to ‘daisy chain’ a trigger signal from a ‘start’ channel, through a number of channels in the ‘chain’ to an ‘end’ channel. Each channel receives the trigger out signal from the previous (or next) channel, and drives its selected trigger out to the next (or previous) channel. The ‘end’ channel trigger out can be set up to drive the ‘start’ channel, closing the loop. In this way, complex and versatile interchannel trigger schemes may be set up. Each channel can have its trigger out and its output waveform set up independently. Trigger out may be selected from Waveform End, Position Markers, Sequence Sync or Burst Done. Data entry Keyboard selection of mode, waveform etc. ; value entry by numeric keys or by rotary control. Memory card Removable memory card conforming to the Compact Flash memory card standard. Sizes from 32 MB to 1 GB can be used. Stored settings Up to 500 complete instrument set-ups may be stored and recalled from the memory card. Up to 500 arbitrary waveforms can also be stored independent of the instrument settings. Power 110 to 120 V or 100 V nominal 50/60/400 Hz; 220 to 240 V nominal, 50/60 Hz. Voltage adjustable internally; operating range ± 10 % of nominal; 60 VA max. Installation Category II.